That State championship bid is certainly something that Terry, senior center-midfielder Luis Lara and the rest of the Hornets have on their minds in the immediate future but Friday’s ceremony in the multi-purpose room at Bryant High School was really about a little further down the road. Both Terry and Lara signed to continue their soccer careers and their educations under scholarship on college next fall. Terry, the son of Kent and Shannon Terry, signed with Ouachita Baptist University in Arkadelphia, while Lara signed with Hendrix College in Conway. “It came down to about four or five schools who had offered me,” Terry related. “Distance was definitely a factor for me. Big family guy, so I didn’t want to get too far away from my family. My little brothers still growing up, so I wanted to be around. “It’s basically where I felt at home,” he stated. “Ouachita was really welcoming. The staff is great. The coaches were really welcoming to me. I met some of the soccer guys. They treated me like I was one of their own from the day I went there. It was big, just feeling at home. That’s why I chose Ouachita. “I was considering OBU too, and Christian Brothers,” said Lara, the son of Minerva Mendoza and Pedro Lara. “The University in Tyler, Texas too. I went to a lot of showcases, just to be seen and where people would like me. Academically, Lara said, “I want to go into pre-law. My family and I have had a lot of problems with me being a part of DACA (Deferred Action for Childhood Arrivals) and I know it can be a very difficult situation with a lot of problems and a lot of confusing situations. I want to help other immigrant families and children and kids with progress in that. I know Hendrix can be the next path to that dream job. “Luis and Henry, I’ve coached for a very long time,” Suarez said. “Henry and I started at 9 or 10, Luis since he was 12 or 13. Both of these young men are truly — I wish I could say that my coaching ability helped them become what they are, but it really didn’t. They’re true athletes. They’re both true leaders on the field. They push their teammates. They’ve worked hard. “And not only did they practice with the club,” he continued, “but they played outside the club, which made them better. They did both spring and fall seasons and indoor soccer and 3v3. It surely shows that they love the sport. “In addition, to being great soccer players, they’re also good mentors,” Suarez mentioned. “They work with the little kids at the club. They’re helping develop a new breed of soccer players. So, they go far beyond just being a good soccer player. 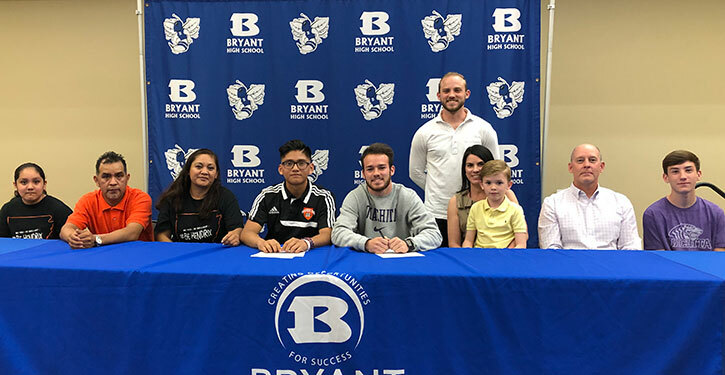 Inman, the head coach of the Bryant Lady Hornets, explained that she was speaking about the boys because she had coached Lara in club soccer and watched both grow through the program. “Henry is very athletic,” Friday said. “He uses that athleticism well and reads the game very well. I think he has an energy level that can take him through the next level and, if he wants to push it and develop his technical ability, even go past that and play a higher level. “He plays up top. He plays wide. Sometimes I play him in midfield. He’s versatile. He can play any position. “The same thing with Luis,” he continued. “He’s savvy. I don’t think the athleticism is way up there, but he makes up for it with his intelligence. He reads the game extremely well. His technical ability. Sometimes he just plays and makes people look foolish. I love his passion. I love his desire. I love sitting down and having the talks with him about tactics and stuff like that. He absorbs information like a sponge. Said Lara, “Competitively, I started playing like around 10 or 11. But my dad, he raised me to love the sport. I really didn’t like it at the beginning but then, as soon as I moved to Arkansas, with all my friends, all my lifelong friends, I started to really love the game. We’d play outside every day and that’s how I really started to love it. Like his brother, Terry ran cross country too. Charlie got a scholarship to Hendrix for running but has since transferred it to soccer. His junior year and this year, he’s been concentrating on soccer. “Definitely something I was born with just because I love to step up to the plate,” Terry said of the leadership. “I love to have the pressure on me just because I know I don’t want to let my teammates down. The competitive nature — it kind of comes with that. “Basically, the captains last year picked the captains this year and I was honored enough to be able to be picked as a captain, to take that role,” he added. Friday mentioned their flexibility, their ability to play at multiple positions. But they have their favorite spots. Lara agreed with his teammate about this season, a State title is the goal.